How to get on radio shows and podcasts? Join our Premium email service to get more and better radio and podcast interview opportunities! You can get TWICE AS MANY Guest Requests delivered right to your inbox compared to our free service! All THREE of our Premium email services can help you get MORE radio and podcast publicity interviews. This is because they include so many Guest Request Alerts that our free subscribers never receive! Getting ALL our interview opportunities delivered makes it easier and quicker for you to get more free radio interviews in your field of expertise, plus they support our service so we can keep delivering more of the publicity leads that your business needs. All newsletters include a 10 Day FREE TRIAL! - Cancel Anytime. How Many interviews do you want? 3. “ALERTS DIGEST": An easy-to-read once-a-week email collection of all the recent Guest Request Alerts in one weekly digest each Wednesday. Compared to our free basic edition, all of these Premium newsletter formats include convenient email delivery of A LOT MORE Guest Requests, a helpful Table of Contents, and a Free Trial! Scroll Down - Which newsletters will help you most? With a 10 Day FREE TRIAL you have no risk but a lot of publicity to gain! Special 33% off New Subscriber Rate only $8.99/month! Subscribe to the Premium ALL Edition to get 100% MORE of our exclusive radio and podcast publicity opportunities! * Early AM Delivery Bonus: As a Premium Alerts subscriber, you get your Guest Requests delivered bright and early in the morning 8 HOURS BEFORE our free subscribers. YOU can pitch the best shows FIRST! * Table of Contents: To save you time, each Premium Edition newsletter has a handy Table of Contents at the top. You can quickly scan to find the interview opportunities that most apply to you. * Get ALL the Guest Requests: This "ALL" edition includes all the publicity opportunities collected from the topic specific newsletters in Option 2 below. * 10 days to try it for free! Cancel in your PayPal account within 10 days and pay nothing. Send emails to what address? Stop missing free publicity opportunities! Get more interviews by grabbing this special low price - it won't last long. Special 33% off New Subscriber Rate only $6.97/month per list! The Premium Targeted Alerts lists bring you genre-targeted interview requests from radio show hosts and podcast producers looking for exactly your type of expertise. All the hot new Premium interview leads in your subject areas for only $6.97/month per list. Every Monday, Wednesday, and occasional Friday email will bring you new Interview Requests that better apply to YOU. 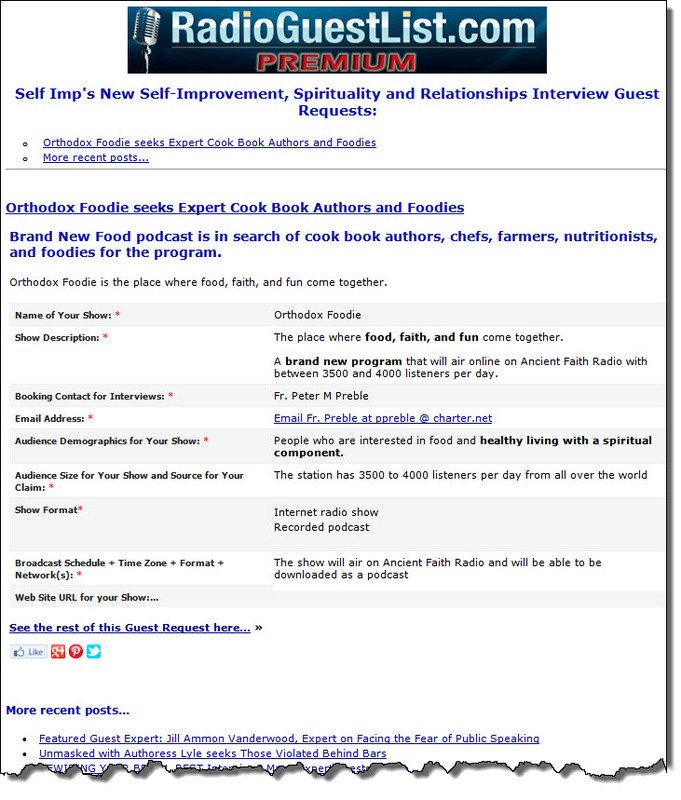 No more scanning long daily newsletters to find Guest Requests about your topics! To save you time, each Premium Edition has a handy Table of Contents at the top. You can quickly scan to find the interview opportunities that most apply to you. Each Premium Alerts list is a different, separate newsletter subscription but there's no contract, it's easy to cancel online, and you can unsubscribe anytime. Each listing in the email shows you the email address for each show's producers - No more clicking through to our site needed for you to get the show contact info. Early AM Delivery Bonus: As an Alerts subscriber, you get your targeted Guest Requests bright and early in the morning. This is 8 HOURS BEFORE our free subscribers. YOU get to pitch the best shows FIRST! 10 days to try it for free! Cancel within 10 days and pay nothing. Grab this special price to lock it in now - it won't last long! Try any of these newsletters for 10 days free. Cancel any time instantly. Now with a 10 day FREE TRIAL, too! Get fewer emails from us by choosing to receive the whole previous week's new Guest Request Alerts in one helpful batch email newsletter each Wednesday morning. Plus each weekly collection of ALL the week's PremiumGuest Requests includes a helpful Table of Contents at the top. Try it free for 10 days - cancel within 10 days and pay zero! Subscribe to any of the Premium Alerts email lists to save time by more quickly finding the shows and interview opportunities that are best for your publicity needs! Sign up above to try any of our Premium newsletter lists today FREE. There are no contracts and it's easy to cancel online any time. We usually send Guest Request emails out on Mondays and Wednesdays, plus some Fridays. To keep things simple, all subscriptions end when the payment plan is canceled. No partial refunds if canceling mid-month after the free trial ends. Please email us if you have questions or trouble checking out. We're happy to help you at help @ radioguestlist.com. Our emailing systems work all the time, every day. If you are not receiving the emails, this is a problem on your end with your spam filters, ISP, or other settings. We're happy to try to help you fix it but we don't know there's a problem unless you tell us. Any refunds are limited to the most recent month only. We publish new newsletters whenever we have new Guest Requests appropriate to that list. This is usually on Mondays, Wednesdays, and occasional Fridays, except for holidays. We need your support to keep our service going and growing. By taking the free trial you'll also support our services which have been busy helping experts and show hosts like you meet each other for free since 2008. You know that even ONE interview on a major radio station or popular podcast can bring you hundreds or even thousands of dollars of sales. RadioGuestList.com PREMIUM is a cost-effective (and probably tax-deductible) PR tool you can profit from! Take a FREE TRIAL today! Cancel any time instantly! Questions or problems? Email us at help @ radioguestlist.com any time, or just reply to any of our emails. Just pennies a day can bring hundreds of targeted publicity interview opportunities delivered directly to your inbox! What do you think of our Premium Guest Request services? Please leave us a Comment below! I have received guest requests from some great podcast hosts and genuinely appreciate getting the listing of shows seeking for guests. Your service has been important to my strategy in reaching more people in my niche audience. This site has been incredibly helpful in helping me to promote my work, my book, and to expand my platform. On average I secure one to two interview opportunities week. It is so convenient and easy to use; thank you so very much! I intend to be a member for quite some time. I've gotten plenty of radio bookings already and been subscribed only a month or so. Thank u.
I first started using RadioGuestList years ago. Since the subject matter of my book is not what would be considered "mainstream", I wondered how it would be received by the radio community. Well, I was pleasantly surprised that many shows were open to it! No matter what your subject matter, I don't think you can go wrong with RadioGuestList. I'm happy with the results I'm getting with the premium service, and I look forward to the emails twice a week to help me continue to get the interviews I need to get the word out about my book. Thank you RGL! I am an author who has used radio guest list as a subscriber to all alerts and targeted alerts. Both have been extremely successful for me in finding radio programs that are interested in my topic ( chronic pain, rheumatoid arthritis and health.) I have found that the only limitation for me is finding the time to pursue all the shows that I'm interested in being on! I am so grateful for this service. Thanks radio guest list for all you do! I’ve beena premium member for a couple of years and it’s money well spent! I’ve gotten several interviews for clients on programs and podcasts that would never have hit my radar through traditional media list subscriptions. So far things are going well. I have had a few responses and will be interviewed on a couple different podcasts. Looking forward to the interviews and seeing the results. As a Publicist, I enjoy getting my clients on hundreds of radio shows. RadioGuestList helps to supplement my usual database with plenty of news shows and podcasts which means I can offer my guests even more great options. Thank you, RadioGuestList! As a filmmaker I wasn't sure how many relevant requests would come in. It took a bit, but this month I've already lined up three interviews. I really like the simplicity of the service and how easy it is to line up interviews. I really appreciate the opportunity reach some great shows - all the more publicity for my upcoming novel Kuwaiti Seeker. Have been with Radio Guest List less than a month and have 3 interviews scheduled. Not sure what's happening behind the scenes or what these will lead to, but so far worth the investment. You guys do a great service. I have been interviewed many times via Radio Interview Guests. I am a professional full time Psychic and have had the opportunity to meet some great people around the country. You do a great job putting people together, Thank you! I was first skeptical about getting connected for interviews about my Suicide Warriors Save a Life inspirational Speaking. Radio Guest List encouraged me to be patient and keep responding to inquiries which I have been. I have got on 2 excellent interviews since. The Premium service on RadioGuestList.com has been amazing! I get invited to be a guest on at least one (sometimes 3 or 4) podcasts or radio shows every week. Each time a show is aired I see a spike in sales for my new book! I shared RadioGuestList.com with my Mastermind group last week. I would recommend it to anyone trying to get more exposure and increase sales. Great service, low price (very important for Indie authors!) and great opportunities!!! I only wish other PR services were this reasonable!! I've been a Premium Member since you first started offering it, and it's been one of the most cost-effective inbound leads resources I use every day in my public relations work. Radio Guest List has been so very useful to targeting which shows I can be of greatest benefit to. They do all the work in finding the interviews and all I need to do is set them up. As a first time author, Gutsy Women Win, it has been so useful finding interviews for an author. I am so grateful for this service. I use the premium Radio Guest List as a part of my daily routine. It is a very valuable part of my toolchest. My PR clients have benefitted greatly from the outstanding shows and interviews available. I look forward to continuing to be a subscriber for years to come. 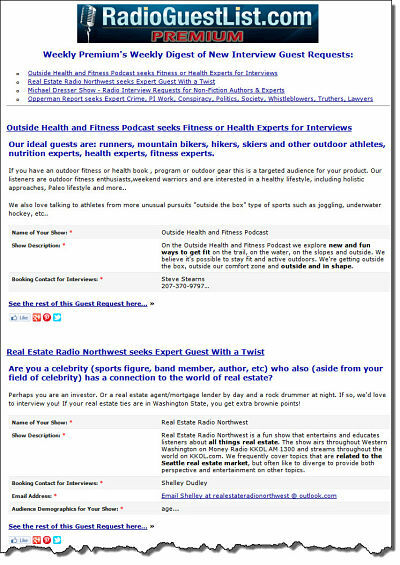 Radioguestlist.com has been great for me to get the word out on how to be happier and more successful. This amazing website made it so much easier so I could focus on clients and have them email me options. RadioGuestList is so awesome! I use it on my Podcast to get Guests and I also use it when I would like to go on other peoples shows as a guest so it works out both ways for me! They make it very easy! I have been a member for only a couple weeks, and already I have booked a few radio interviews. I have not seen any increase in business yet, but I think it is way too soon for that. For the price, this has been a wonderful service. I'm looking forward to see what it can do over the next couple of months. I have booked several shows based on these listings, for both my animal communication business and my book. I had done independent research to try to find shows seeking guests but didn't come up with anything that I've heard of from RadioGuestList.com, so this service has been a great advantage. I'm a formerly homeless disabled LGBT person who became a successful hypnotherapist and entrepreneur. I joined hoping for some interviews and this did not disappoint! My interviews increased dramatically. Thanks! I am a Neuroplastician but it has been hard to get the word out. Thanks to you I will be able to reach so many people who want to improve their focus, memory and accelerate their cognition! This site has given me some great guests for my show... Its an amazing tool and I support them big time! I subscribed to RadioGuestList about 3-4 months ago. As a regular subscriber to HARO (Help A Reporter Out), it was a natural fit for me to subscribe for radio/podcast queries. My business, Standing Out Online, works with entrepreneurs and industry visionaries to help them discover their personal story to enhance their personal brand, especially using online tools and platforms. Each week, I review the queries from RGL and have pitched four of them. Each one has invited me to be a guest on their webcast or podcast. Those podcasters who also do some promo of their guests before and after are those I gravitate toward because I enjoy helping promote them and their show as well. Many podcasters tell me that I do more promo for them than many of their guests! This is what it's all about in business - especially using online tools - to help one another and double the reach we get from just our own networks. There are so many great business podcasts/shows out there and I've met such interesting people. From an SEO standpoint, I see that each of the shows where I've been a guest, are showing up in Google search results within less than 2 weeks. That's extra bandwidth, and that's good business. Sign up for the premium service as it will serve you much better and it's incredibly affordable. Thank you, RGL! I joined the Radio Guest List paid premium service two months ago. Immediately I secured three national radio interviews which sent the sales of my book through the roof and also triggered three more interview requests. I love this service. It's easy to use and effective. Get more publicity for yourself like these folks! Scroll back up to choose the RadioGuestList.com Premium Edition that's best for you!